← The excellent good news of No Dakar through Bolivia! Freedom of the Press under peril in Bolivia! It is a total shame that prestigious journalists like Amalia Pando, Raul Penaranda, Carlos Valverde, Andres Gomez, Humberto Vacaflor had suffered political persecution, and their right to work had been curtailed by the coca caudillo government! Bolivia is experiencing political persecution, blackmail and extortion! A state of financial suffocation this week pushed a journalist and an independent press to request the support of its readers, in an emergency that the National Association of the Press of Bolivia (ANP) attributes to a systematic campaign aimed at weakening the independent media. The entity that groups the written media of the country referred to the journalist Amalia Pando, in principle, and now the newspaper Pagina Siete, which launched emergency plans aimed at mitigating the difficulties generated by the lack of advertising revenue, both private as well as public. 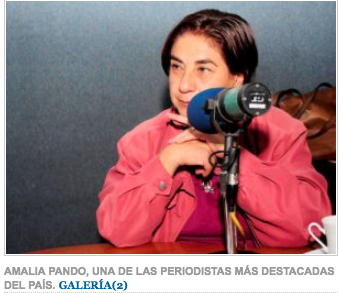 Pando said that government agencies do not publicize in her “lobbying” radio program and her social networks, but the fear of tax reprisals also scares off private announcers, who detracted from the work of the journalist and her team of journalists. EL DIARIO also denounced the double pressure. The Government does not place publicity in the centenary newspaper and, by the testimony of private advertisers, tax service agents warn that the purchase of spaces in this independent newspaper will imply an economic sanction. “The income with which Pagina Siete operates is the product of our work; We do not have perks of any kind,” says a message, addressed to the readers of the virtual page of the printed media. “To develop serious and independent journalism, essential in democracy, which you appreciate in Pagina Siete, we have a team of first-rate reporters, editors, photographers, administrative and commercial,” reads the end of each news item offered through its page http://www.paginasiete.bo. “If you want to support the effort we made, subscribe to P7 VIP, to receive an informative letter by email from Monday to Friday, which will contain a summary of the most interesting news and opinions of Pagina Siete, at a cost of only Bs15 per month (a little more than two dollars),” reads the invitation to readers. The situation of journalism in Bolivia is very difficult and reflects the denunciations made by the president of the ANP, Marcelo Miralles Iporre, during the hearing on the Situation of the Right to Freedom of Expression and Freedom of the Press in the Andean Region in the framework of the 167 Period of Sessions of the Inter-American Commission on Human Rights (CIDH), held on February 28, in Bogotá. Miralles described to the members of the IACHR the set of rules and policies of the ruling party aimed at silencing the work of journalists and independent media. A total of 12 decrees and laws impose the publication of notices and government campaigns for free, and subtract 30 percent of income from private media, according to data generated by the affected newspaper companies. In that line, days ago the ANP also warned that the policies applied by the central government, of economic suffocation to the independent media, put at risk the job stability not only of journalists, but of all those who work in the field of information. “The National Association of the Press of Bolivia expresses a deep recognition to the hard work of women and men journalists, and warns that the policies of asphyxia to the mass media are pushing to a situation of labor instability in the sector”, affirmed the entity. This entry was posted in Bolivia, Business, Politics, Social Unrest and tagged corruption in public office, demagogue, democracy in peril, freedom of choice, freedom of the press, government failures. Bookmark the permalink.